JSP provides an action element <jsp:include> which allows you to include the output or contents of another web page within the current web page at any specific location. This is a shortcut syntax of <jsp:include> action element, which includes the web page pointed by the URL. This is a another syntax of<jsp:include> action element which does the same thing as previous syntax but it's just a longer version. Next, in JspInclude1.jsp web page, we are going to include the output of the web page Sample.jsp at a specified location. We are going to include another webpage in this webpage. 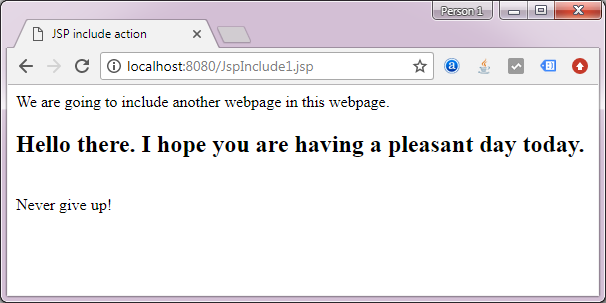 Executing the JspInclude1.jsp web page not only shows its own output but also includes the output of Sample.jsp web page, exactly where we placed the <jsp:include> action element within JspInclude1.jsp web page.